Similar to pink sapphires, purple and violet sapphires exude a subtle grace and are available in a large range of hues for wide appeal. 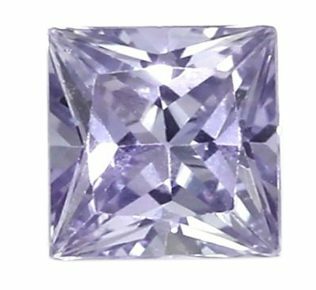 A Ceylon cushion cut purple sapphire with beautiful light reflection. The colors of purple and violet, especially purple, also have a deep royal history, much like blue sapphire, and create a gorgeous depth of hue and tone in a sapphire. Purple wears beautifully on just about every skin tone and fits with every season. The colors purple and violet are often confused, but are actually distinct hues. Purple is a blended hue of red with a mixture of blue tones. Violet, on the other hand, is a blended hue of blue with a mixture of purple tones. In 2019, purple sapphires are likely to increase on the popularity that they experienced in the previous year. The royal history of the color purple lends a powerful and luxurious quality to the hue that is very appealing. Purple sapphire engagement rings offer a really unique way to incorporate a favorite color, or a lovely alternative to blue or pink sapphires, but still carrying some of those tones, naturally. A stunning oval violet sapphire and diamond three-stone ring. 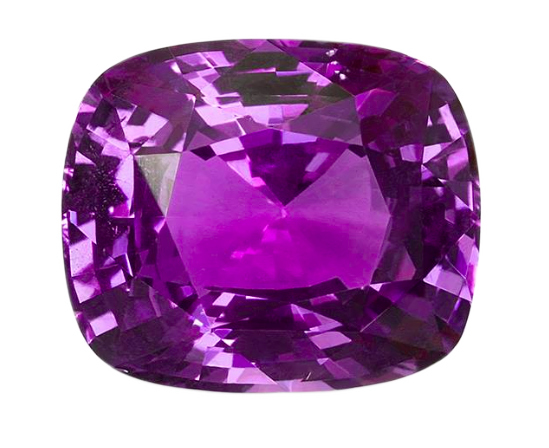 These colors may be considered more obscure due to the availability of other purple and violet gemstones. However, sapphires are far more durable and brilliant than other stones of the same color. 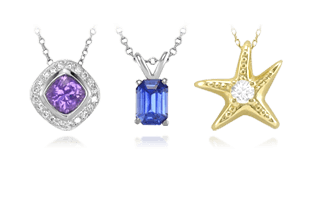 Experienced jewelers and gemologists can distinguish sapphire from amethyst by luster alone. The color of violet and purple sapphires is much more stable under normal conditions, whereas an amethyst’s color is sensitive to heat and light. 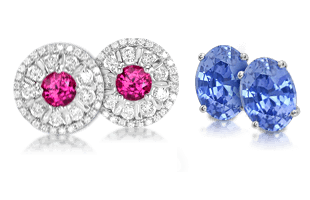 Sapphires are not nearly as susceptible, proving to offer a much more fluid color. 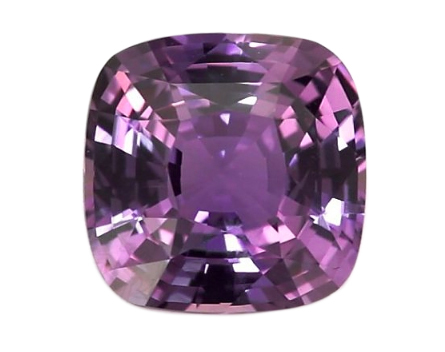 A cushion cut purple sapphire from Ceylon. Many purple and violet sapphires show subtle shifts in color under different kinds of lighting, they will appear violet under daylight or fluorescent lighting, and distinctly purple under incandescent lights. 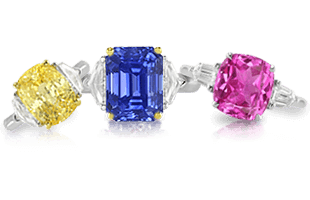 These “color-shift” – as opposed to “color-change” – sapphires are popular with gem connoisseurs, who will pay premiums for stones with strong to vivid saturation and a conspicuous color-shift. For 2019 trends, purple sapphire rings have a lot of options going for them that will perfectly enhance the look of the stone, the cut and shape, and the color. 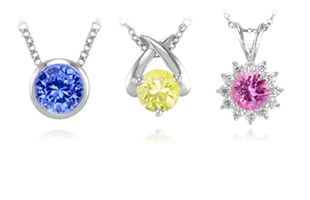 Trends rising in popularity, like warmer tone metals of yellow and rose gold are very well suited to a purple sapphire. 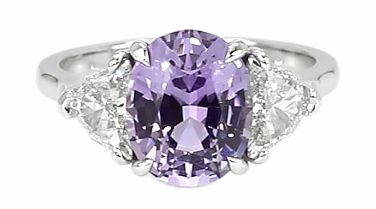 Also, as purple sapphires are available in a range of carat sizes, the 2019 trend of a return to embracing vintage cuts that are typically elongated – think oval and emerald – a purple sapphire will retain a larger carat size even with a vintage cut. A classic princess cut on a pale violet sapphire. These sapphires primarily originate in Sri Lanka and Madagascar, but can also be found in Tanzania, Kenya, and Myanmar. The mixes of purple-blue and pink are found in tone rages from light pastels to more rich and saturated shades. These are almost always untreated. These sapphires can be quite expensive in very fine qualities in large sizes. The rare colors are reminiscent of tanzanite, but are far more durable because they are sapphires. We continue learning about unique and rare sapphire colors next with Peach Sapphires.